Located in Castro Valley, California just 25 miles from San Francisco city centre, this motel offers a 24-hour reception and simply furnished rooms with free Wi-Fi. All air-conditioned rooms at the Valley Inn Motel include cable TV with extended channels. Featuring simple decor, each en suite room provides a seating area. Providing easy access to Highway 580, the Valley Inn Motel is close to a variety of Bay Area attractions. The Oakland Coliseum is 15 minutes’ drive away. AT&T Park is 23 miles from this hotel. Located off of Interstate 580, this Hayward motel serves a daily continental breakfast. It offers simply furnished rooms with free Wi-Fi. Oakland International Airport is 10 miles away. A cable TV is provided in each room at Super 8 Motel Hayward. For convenience, guest rooms include a refrigerator and a coffee maker. A 24-hour front desk greets guests at Hayward Super 8 Motel. Fax and photocopying services are available. Vending machines featuring snacks and drinks are also on site. Oracle Arena is a 10-minute drive from this motel. Central Oakland is a 20-minute drive away. Lake Chabot Regional Park is an 18-minute drive away. 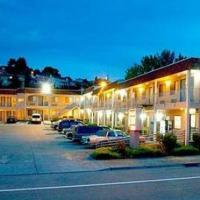 This centrally located all-suite hotel is minutes from Oakland International Airport. It serves a hot breakfast featuring eggs, yogurt, cereal and hot waffles. All guest rooms feature free Wi-Fi. All of the spacious suites at Comfort Suites Castro Valley feature a satellite TV. Suites include a refrigerator, a microwave and ironing facilities. Free local calls are available. Guests can enjoy free coffee in the lobby of Castro Valley Comfort Suites. Guests have full access to the 24-hour work out facility. Nearby attractions include the Chabot Space and Science Center, Oakland’s Chinatown and the Oakland Museum of California.